A note from Paul Solman: Former Goldman Sachs trader, biotech entrepreneur, money manager and economics professor at Harvard’s Business School and Kennedy School of Government (where he taught me microeconomics), Terry Burnham, now teaching at Chapman College, is best known for his books “Mean Genes” and “Mean Markets and Lizard Brains.” But he may be better known to NewsHour viewers from his appearances in stories on the dot.com crash, evolution and economics and the neuroscience of economics. Burnham says we are headed for another stock market crash and Great Depression, due to the wanton printing of money by central banks like the Federal Reserve. “How can we believe,” he asks, “that printing money will make us rich?” Here’s his answer. My skeptical response follows. Terry Burnham: We are hostages to the destructive actions of central banks. Printing money destroys value. The puzzle is not economic, but rather psychological. Why do we allow Central Bankers to make us poorer and endanger us physically? 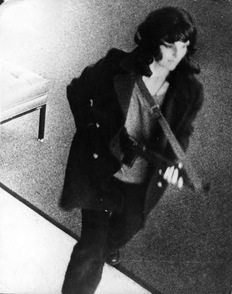 Patty Hearst holds an M1 carbine during the April 1974 Hibernia bank robbery. Photo by Federal Bureau of Investigation. The answer lies in our non-rational brains. One aspect of our psychology, labeled the Stockholm Syndrome, is the human propensity to develop positive feelings towards captors in a form of traumatic bonding. Nils Bejerot coined the phrase after a 1973 Stockholm bank robbery where four hostages were held for close to a week. Even after being released, the hostages showed sympathy for the robber, and blamed the police. The most famous U.S. incident is that of Patty Hearst, who joined the organization that kidnapped her and took part in a bank robbery with her abductors. The phrase “economy supported by central banks” generates more than half a billion Google hits. Can it really be true that printing money is going to make us rich? No. Printing money can destroy an economy, or its effects can be close to neutral. Destruction occurs when the money printing severely distorts economic decision-making. We cannot see the full impact yet of recent printing, but we can look at the last round of printing. After the NASDAQ crash in 2000, the Fed funds rate of very short-term (overnight) interest rates was cut from 6.5 percent to 1 percent. The unemployment rate at the time was a little over 5 percent. The subsequent problems created by the Fed were much larger than any short- term benefits during the low-rate periods. Printing money shifts wealth from the prudent to the profligate. The Federal Reserve is specifically trying to drive down interest rates. Borrowers are happy to pay fewer dollars in interest. For every dollar not paid in interest, there is a saver that is made poorer. To the extent that the Fed is able to reduce interest rates, it transfers money from savers to borrowers. Distorting prices leads to bad decisions. Interest rates are prices and incorrect prices lead to bad choices. The most obvious of these are investments in risky assets because lower risk assets have rates close to zero. We will only see the impact of the bad decisions in the future, but we can be sure they are being made now. Even the supporters of the Fed’s creation of money argue that at best, it would be only slightly positive. So we return to the central question. How can we believe that printing money will make us rich? Imagine that you are a retiree with financial assets of $120,000, which is the median wealth of American retirees. If you invest this money as safely as possible – in 3-month Treasury bills — you will earn a total of $60 a year in interest before taxes and inflation. So you have barely $1 a week to live on. This is the financial version of intimidation and abuse. Many of us suffer the Stockholm Syndrome and support the central printers (I mean bankers). The outcome will not be pretty and the guilt lies with the bankers, not with the hostages. If I’m right, the current “boom” will end with a bang, not a whimper. Or more accurately, perhaps, a deafening thud. The stock market is booming because of the Fed printing money and using it to buy U.S. Treasury bonds. As a result, the Treasury doesn’t need to offer much in the way of an interest rate to attract buyers of its debt. Low interest rates on Treasury bonds punish investors, who become desperate for higher returns. They flood the stock market. In addition, low interest rates allow speculators to gamble, borrowing cheap to chase higher returns. Again, the cheap money fuels the stock market – and all other speculative markets as well. Why not invest in almost anything if you can do so with money you can borrow, short term, at close to zero percent? Moreover, as long as the Fed continues to create new dollars and use them to buy U.S. bonds, the bond market will be propped up as well. I don’t know when this will end. Neither does anyone else. But end it will. After that, there are no certainties, only probabilities. But I believe there is a substantial probability that the outcome will be worse than the Great Depression. In retrospect, people will feel contrite about having believed in printing our way to prosperity. But, like Patty Hearst, they will probably tell themselves they had no choice. In any case, it will be too late. Paul Solman responds: Too much money? Too late? Maybe. Then again, maybe not. Maybe the Fed (and other central bankers) are doing what it takes to reinvigorate economies that have been artificially depressed in the wake of the Crash of ’08. Maybe they’re being careful about how they do it, by paying interest to banks — the so-called “Interest on Excess Reserves” (IOER) — so that the money being created doesn’t rush out into circulation. IOER is something we’ve tried to explain here for years. Maybe they’re trying to put the tens of millions of unemployed people in the developed world back to work. How should one assess Terry’s doomsday scenario? It’s good to remember that even those who cry wolf are sometimes right. So, is there evidence of wild, unsustainable speculation? A stock market bubble, for example? Well, yes, the market is scaling new heights. But compare it to December of 1999, when the Dow Jones hovered near 11,500. With the Dow at 15,000 today, that’s a compound rate of return of less than 3 percent a year, just barely keeping pace with the rate of inflation. In other words, by 1999 standards, the Dow hasn’t returned a dime in real, inflation-adjusted returns. So is it really at some kind of new speculative high? Sure, sure, December of 1999 was the height of the dot.com “bubble.” And yes, today’s price-earnings ratio of American stocks is higher than average. But at a ratio of something like 20:1, today’s P/E is less than half what it was 1999. Mightn’t an alternative explanation to Burnham’s and David Stockman’s bubble hypothesis be that the stock market is expensive because shares of American companies are actually worth more these days than they used to be? Profits, as opposed to wages, account for a historically unprecedented share of corporate income, but is that a one-off bubble-like event or a function of labor’s deteriorating bargaining power, a trend likely to continue? And what about housing? A speculative bubble? Yes, prices are rallying, but they’re still 30 percent or more below their levels of 2006-2007. Meanwhile, the budget deficit is down, unemployment is down (if still stubbornly high), millions of Chinese and others are still leaving the farm for the city, where they keep world inflation in check by working cheap. And for all the hand-wringing about a productivity slowdown, technology is working wonders. Hey, with the natural gas revolution, America even has excess fuel to burn! But perhaps most persuasive, as I suggested to David Stockman when he made this same doomsday argument in an interview the other day, is that world interest rates are at historically unprecedented lows. That simply makes no sense if the world’s central bankers, like the Fed, are out of control. If the Fed and friends are “printing” too much money (they’re actually creating it electronically), then interest rates would have to reflect the fact. What is an interest rate composed of? The value of having the use of the money as opposed to someone else having the use of it. In other words, the rental cost of the money; how much you will get paid to wait for its return. The risk of default: how much you will get paid for taking the chance that you might not get paid back. The risk of inflation: that you might get paid back, but in dollars (or yen or euro) that are worth a lot less, in buying power, than when you loaned them out. So, what are world interest rates right now? Give me a moment while I check the Bloomberg app on my iPhone. Let’s see. The United States: 1.76 percent to borrow money for 10 years. No, that must be a mistake. The historical price or rental cost of money or risk-free rate of interest is something like 2 percent, at least. The world’s collective investors can’t be lending Uncle Sam money for a decade as a gesture of good will, can they? Oh, and wait a second. I forgot about the default risk. That must be worth a few hundredths of a percent, no? And OMG! We all forgot about inflation. (Let me look that up.) Hmm, inflation is running at an annual rate of 1.8 percent at the moment. In short, the impossible is happening: investors are lending the US money for less — much less — than it figures to be worth when they get paid back 10 years from now. Oh, but that must be because, as economist Douglas Holtz-Eakin famously pointed out, America “is the best horse in the glue factory.” That is to say, people are lending us money (by buying our bonds) for safe-keeping; everywhere else in the world is even riskier. So all we have to do is look at interest rates elsewhere to get a true picture of the money printing madness that’s taken hold globally. Okay, how about England? 10-year bond rate: 1.77 percent. France, one of those countries where they take to the streets if you threaten to cut their pensions? 1.81 percent. Italy, totally dysfunctional, where that Silvio Berlusconi character is still a power broker? 3.83 percent. That’s not much more than a bank would charge me and my wife for a mortgage and it’s got our house as collateral — a house in which our equity stake is probably 70 percent. And in case you (and Terry and David Stockman) remain skeptical, I offer you Japan. Ten-year interest rate? 0.6 percent. Japan. The country where they’re desperate to create inflation. The country with a ratio of government debt-to-GDP well above 200 percent while people go nuts in America because, by the most generous reckoning, our ratio has reached 100 percent. Admittedly, things could change quickly. It was suddenly spiraling interest rates that triggered the demise of AIG, of Lehman, the formal government takeover of Fannie Mae and Freddie Mac. Admittedly, it is a probabilistic universe and disaster could strike at any time. All one can do is place one’s bets. I may wind up feeling as bad about what I’m about to write as Patty Hearst must feel about her stick-up attempt but at the moment, I won’t be putting my nest egg on double zero.